When it comes to skincare products, some have a reputation that’s hard to beat. For me, one skincare product I had heard so much about, was the Liz Earle Cleanse & Polish Hot Cloth Cleanser. Everyone raves about this, and my best friend swears by it. However for some reason, it wasn’t until we went to London for the day and she bought some, that I decided it was time for me to give it a go too. As the shop assistant stood chatting away to my bestie about how good the Hot Cloth Cleanser is, I was gradually going all heart-eye-emoji and swooning. I knew then and there I’d be trying some pronto. So when the lovely people at Liz Earle sent me some to try, I was more excited than a child in a toy shop. As an extra special treat, they sent me their new rose and lavender version which smells lovely – so floral! The lavender means it’s got a real aromatherapy scent to it, which I find makes me feel really relaxed and it’s also got quite a soothing affect. It’s not an overpowering scent, but it’s strong when you apply it – there’s no missing it! But I love strong scents, so it’s perfect for me. 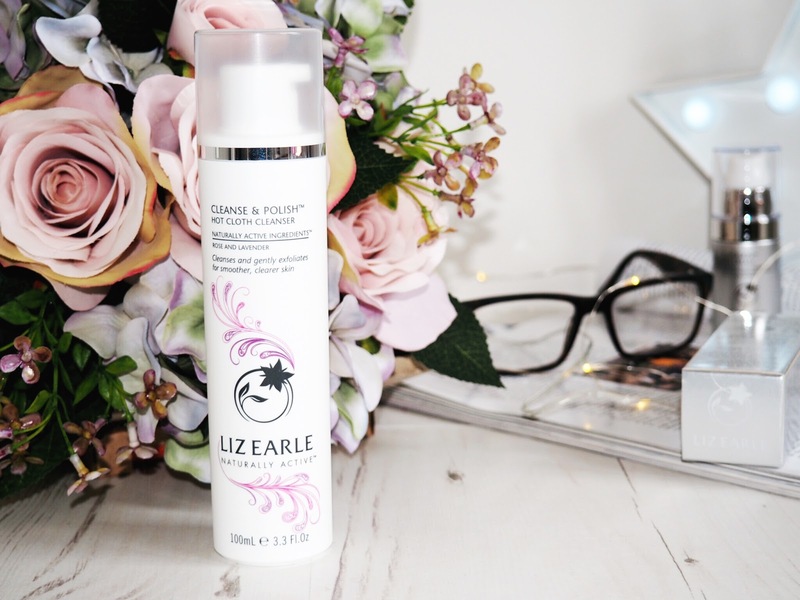 If you haven’t yet heard of the Liz Earle Cleanse & Polish Hot Cloth Cleanser, then you must have been living under a rock – it’s won 120+ beauty awards and it’s raved about in magazines, on TV and all over blogs and social media. Liz Earle say that it’s the foundation product for fabulous skin, and now that I’ve been using it for nearly three weeks I can absolutely see why. The consistency itself was a really pleasant surprise when I first started using this – it’s like a really thick cream. You don’t need much of it at all as it’s such a rich texture and a little goes a long way. Price wise it’s very reasonable at £20.50 for a 150ml pump and 2 muslin cloths. Which with the consistency means that one pump will last for ages. The Hot Cloth Cleanser is dual purposed because it acts as a cleanser and a polisher – all in one. What that actually means is that the product works in two phases – firstly as the cleanser, you apply the cream all over your face, including eyes and neck. Then phase 2 is the polishing, where you use a muslin cloth rinsed in warm water to gently polish off the cream. The cleansing stage removes make-up as well as removing daily grime and traces of dirt. This is what I love about this product – that fact that it removes make-up as well as being a skincare product. Make-up removal is a separate stage of my skincare regime, so combining the two is genius – and a huge time saver. It removes the most stubborn make-up, including waterproof mascara and my dark eyeshadows with ease (you know I love my smokey-eye looks!) The beauty of this cleanser is that is so nourishing – my skin feels so soft after using it. I first tested some on my hand when it arrived and pumped too much out, so I rubbed it into my hands as a hand cream, and my hands had never felt so soft! That showed me how lovely my face was going to feel after using it, and it’s all thanks to the cocoa butter that’s one of the key ingredients. The polishing stage removes dead skin cells and the dirt that clogs pores, which leaves my skin looking radiant and healthy and I feel so much happier about my face when I’ve used this. It’s the perfect way to start your skincare regime everyday and I like to use mine in the morning and then again when I get home from work to take make-up off etc. I also like to use this before I have my weekly Sunday pamper session with face masks etc, because I feel like it preps my skin perfectly. I’ve been using this for nearly three weeks now and I’m loving how quick and easy it is to use, and still it manages to tick off a huge chunk of my daily skincare regime. I don’t have sensitive skin, but my best friend does and she’s been using this for years – it’s a great product for all skin types and my skin looks and feels lovely after using it. I’d use this just for it’s make-up removing qualities, but it’s got so many other great features that I can’t imagine it not being part of my skincare regime now. 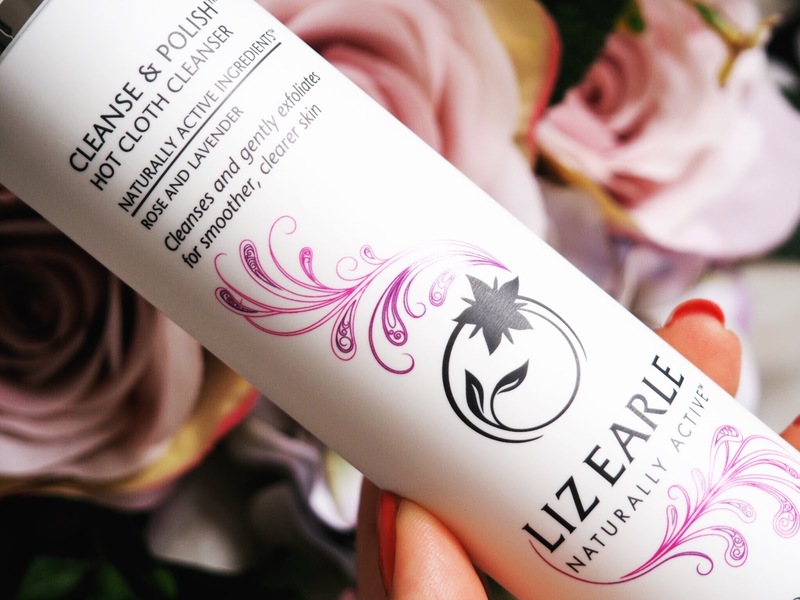 You can buy the Liz Earle Cleanse & Polish Hot Cloth Cleanser here. 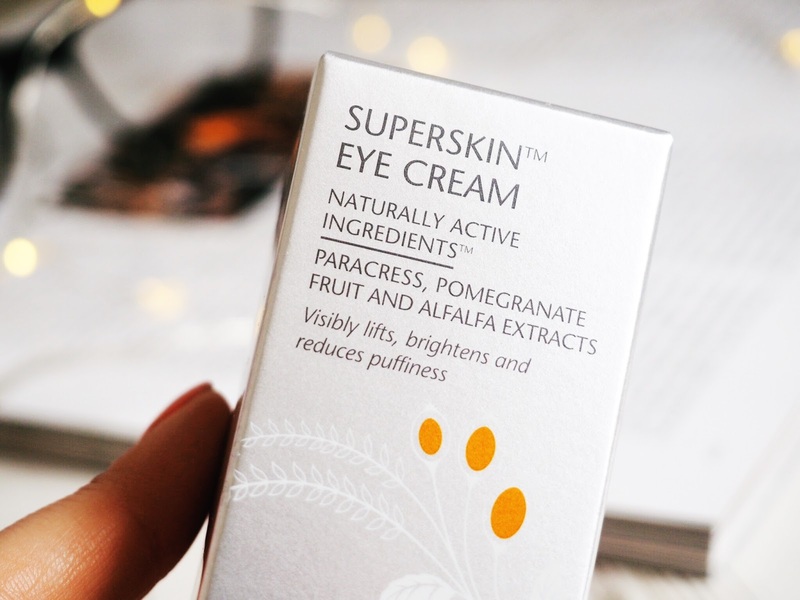 The second Liz Earle product I’ve been trying recently is their new Superskin Eye Cream. Designed to slow the signs of ageing and improve the look of the under eye area, I’ve never used a product designed for fighting the signs of ageing before. Being 27 I’ve not thought I needed to yet but actually, after doing some research, I found out that at this age (27-32) environmental exposure can cause dark circles and it’s at this age that the very first of the fine lines start to appear. The eyes are the first area on our face to start showing the signs of ageing because the skin is the thinest and most sensitive there. When I read that, I was getting the cream out of the box so quickly – determined to right now nip this signs of ageing malarky in the bud! So, how does it work? Well, you apply the eye cream in dots in the area under your eyes – a fingertip sized dot is what I’d recommend all the way round the hollows. Then using a circular motion you massage the cream in and finally you then smooth outwards. Liz Earle advise you do this three times but I think it depends on when you feel the cream is properly dry. Depending on how much you’ve applied, you might need to do this more or less than three times. The sensation is noticeable, it’s tightening – you can feel the skin physically tightening when you’ve applied it – which is exactly what you want. People who complain when a skincare product has any type of sensation need to rethink their skincare strategy. If you want a product that actually produces excellent results, you need to expect some sort of sensation – I’d be worried if I felt nothing. However the sensation isn’t even remotely painful, it’s not even unpleasant – it’s just tightening. And I think that’s to be expected for a product that is designed to tighten skin! So what are the results like? Well, after nearly three weeks of use I have noticed a smoother appearance to the skin underneath my eyes and the hollows look less dark now too. My eyes look brighter as a result, and I’m really happy with the outcome and will continue to use this now. I hadn’t noticed how dark the bags under my eyes were until I tried this, because suddenly the improvement was noticeable! I need less under eye concealer now and this makes me feel like I’m combatting the problem rather than covering it up. Always fight from the source! For only £35 this eye cream will last for ages too as you only need a very small amount during each application and it gives really lovely looking and feeling results. 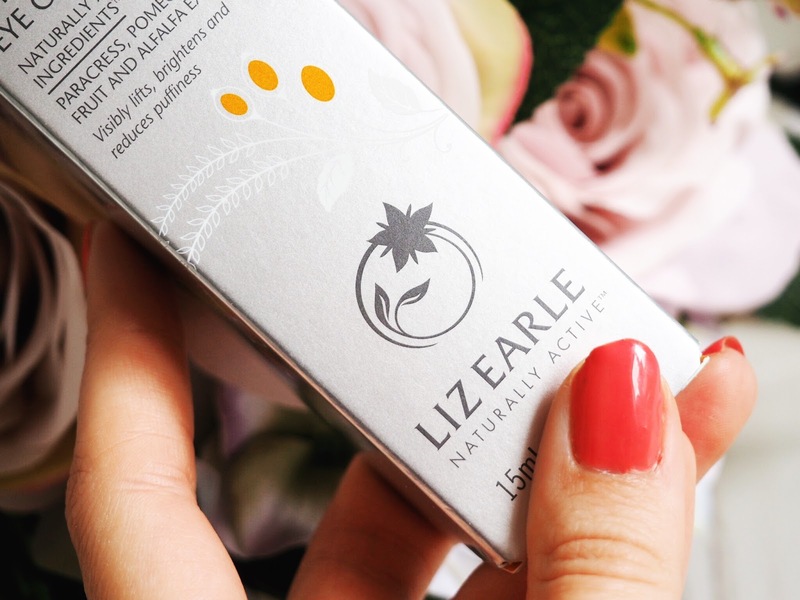 Buy the Liz Earle Superskin Eye Cream here. 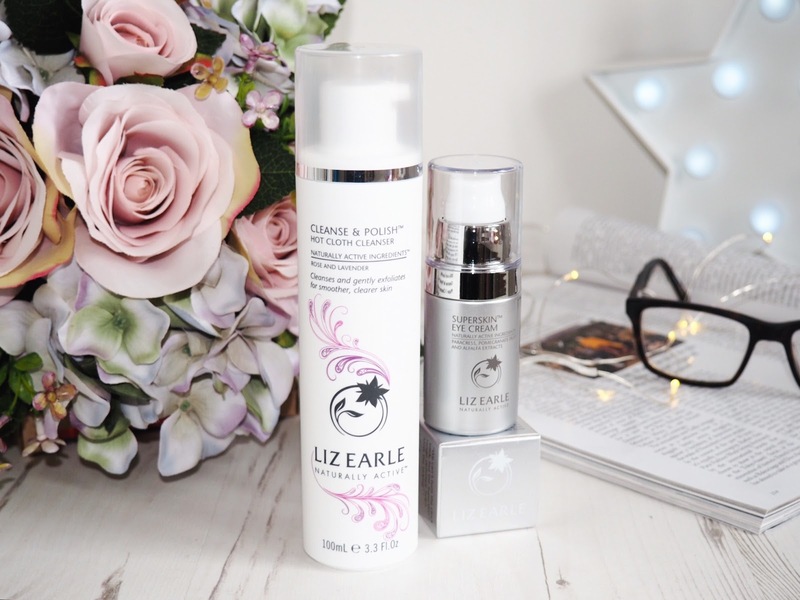 So, Liz Earle gets two big gold stars from me for these products and I highly recommend you check them out – they’re both made with naturally active ingredients and they will both slot perfectly into your existing skincare regime.